Nearly 2,000 years before Homer wrote his epic poems, the Minoan civilization was centered on the island of Crete, a location that required the Minoans to be a regional sea power. And indeed they were, stretching across the Aegean Sea from about 2700-1500 BCE, with trade routes extending all the way to Egypt. The Minoans may have been the first link in the “European chain”, leading to the Ancient Greeks and beyond, but questions persist over the origins of the civilization, the end of the civilization, and substantial parts of their history, including their religion and buildings. All of this is largely because their written language, known today as “Linear A,” remains undeciphered, and among the more enigmatic finds of this truly enigmatic culture was a small disk-shaped object excavated among the ruins of the Minoan city of Phaistos in 1908. The disc, which has since become known simply as the “Phaistos Disc,” contains a number of pictographic symbols that were unrecognized by the scholars who first laid eyes on the object and remain unknown in the more than 100 years since. 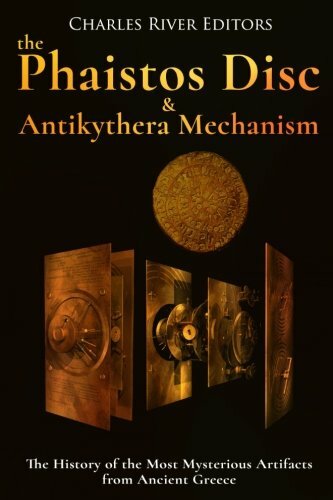 The contents of the Phaistos Disc, like the Minoan language of Linear A, remain unclear, but that is not for lack of trying by a plethora of scholars, some more credible than others. Many different theories have been advanced, but there is still no consensus concerning its origins, or even if it was intended to be writing. Discovering ancient shipwrecks hasn’t been a novelty for thousands of years, but when artifacts were salvaged from a Roman shipwreck off the Greek island of Antikythera in 1900, the discovery of one set off one of the great mysteries of antiquity. When sponge divers investigated the shipwreck, they found the kind of items often associated with such discoveries, including marble statues, pottery, jewelry, and coins, but they also discovered a strange object, the likes of which nobody had ever seen before. Initially assumed to be pieces of rock, it turned out that the item, soon to be dubbed the Antikythera mechanism, consisted of dozens of pieces, many of which had gears. In fact, while scholars quickly deduced that it had an astronomical purpose, many believed the mechanism was too advanced to actually date back to antiquity. As it turned out, of course, the Antikythera mechanism did date back to the 1st or 2nd century BCE, and as scholars began to more fully comprehend its abilities, fascination over the device grew. In conjunction with the determination that the mechanism was an analog computer of sorts that could predict astronomical phenomena like the positions of stars and eclipses, conjecture over the origins of the device led to theories over what the Romans were going to do with it, and whether the device was created by the Greek genius Archimedes himself. To this day, debate continues over whether there were predecessors to the model, where the astronomical observations that went into creating the model were taken, and whether the ultimate origins of the device might even be Babylonian.